Every week I say to myself, now it's time to do a review of a disappointing book. But, then, I postpone the "bad book" for one more post. My blog is mostly about book recommendations. Great books - I want to recommend the best. So, indeed, how can I keep Chris Van Dusen's The Circus Ship waiting any longer. I feel guilty even thinking about leaving it aside again. It's a gem! A classic! No.... wait. We don't need the cliches. Just open it - and you will see. It is simply so incredibly, incredibly good. The Circus Ship first blows you away with its fantastic art. Van Dusen's animals look as real as if you were watching a National Geographic special, but at the same time they are as cute as the cutest from Disney's menagerie. Put all this into a 19th century setting and sprinkle it all with a masterful text in perfect rhyme. 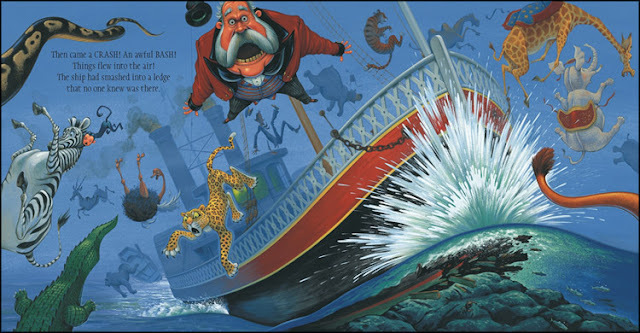 Secondly, The Circus Ship has an involving story about a circus ship that carries fifteen animals to Boston for a circus show, but it smashes into an underwater ledge. The good Captain Carrington and the spiteful circus manager Mr Paine manage to save themselves in a boat, while the animals fend for themselves. They swim until the dawn breaks and reach the shore of an island. Villagers are shell-shocked to see the newcomers ("There is an ostrich in the outhouse! There is a hippo in the spring! "), but welcome them and even protect them (after a tiger helps to save a baby girl from a fire). Together the locals and the animals manage to trick an angry Mr Paine who comes with a new ship in an attempt to reclaim his show circus. Since reading the book, the calous Mr. Paine has become a new negative role model for my twins. On the other hand, they are quick to contrast him with the ship's Captain Carrington - "who was honest and sincere". This would be a banal contrast at most, where it not for Van Dusen's magical art that captures the essence of the two principal human characters in the story. Finally, Chris Van Dusen's rhyming is spot on, while the rich vocabulary and the dramatic aspect of the story are fantastic. My twins could not lift their eyes from the pages during our read aloud. 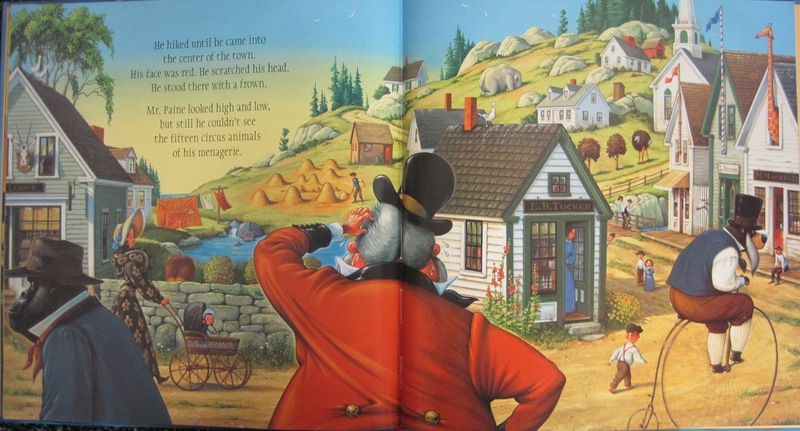 Dusen had a stroke of genius when he hid all the animals (in fact they are hiding from Mr Paine) on a double page spread. 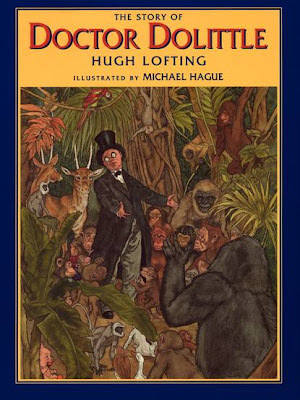 The kids have a blast everytime we read this book to find all the hidden circus beasts, which are masterfully merged with their surroundings. To those who have read Van Dusen's Mr Magee series - Down to the Sea with Mr. Magee, A Camping Spree With Mr. Magee (read my review) and Learning to Ski with Mr. Magee - there is even the added treat of discovering a minuscule "Mr Magee and his little dog Dee" inside The Circus Ship. Curiously enough, the basic idea for The Circus Ship germinated from an actual event. Namely, according to Chris Van Dusen's note at the end of the book, the Royal Tar steamer carrying more than a hundred passengers and a complete circus was sailing from New Brunswick to Portland, Maine on October 25, 1836. The list of animals included an elephant, two lions, a tiger, a leopard, six horses, a gnu, two pelicans and exotic birds and serpents. The ship ran into a gale off the island of Vinalhaven and the ship went up in flames. There were rumors afterwards that some of the animals survived by swimming over to nearby Brimstone Island. Of course, this story served only as a skeleton for the Circus Ship picture book that will certainly inspire children with its art and its masterful verses. Although this is the latest Chris Van Dusen book that I purchased (I still don't have them all), I simply had to review this masterpiece first. No need to apologize! I am late with my response too (blush). I am so happy that you enjoyed it! It is a true treasure and a life changer. Good children's books transcend their original purpose - they become part of who we are. Your message moved me and I am touched that you enjoyed all the reviews and book tips. Thank you so much for taking the time to tell me! For the past seven days or so (I'm not counting), I took a brief pause from blogging - but I never take a pause from reading aloud! Do you know that I had to go back to The Circus Ship, just to see that hilarious gorilla! Chris Van Dusen is a funny man and great illustrator indeed! I love your words: "Who says Reading Aloud benefits only the kids!" Hi there, Read Aloud Dad! First, I just have to say how much I love your site! It has taken me far too long to actually contact you to let you know, but I think what you do is simply fabulous. Thank you! We love all of Chris Van Dusen's books, and are particularly enamored by his latest, If I Built a House. I'm actually going to read it next week when I'm the "mystery reader" in my son's preschool class, and plan on buying our own copy soon. I just love the creativity and imagination it inspires on top of being an all-around fantastic book to read aloud! If I Built a Car is another one of our favorites, so I thought I'd mention them in case you wanted to check them out. Read on, Ninja! And thanks again for all you do! Thanks so much for letting me know! Wow, I get so emotional when I read comments such as yours. Every now and then, I get that feeling that I may be missing the point with my posts and that Read Aloud Dad has become "just another boring and repetitive blog" - and then a comment like yours comes to shine a light on my day. Funnily enough, Read Aloud Dad has a served a much greater purpose for me than blogging. I got into contact with so many like-minded parents and teachers. And this gave me an extra boost of confidence about reading aloud to my kids. And wait a moment. I simply love what you are doing on 365 Great Children's Books - just look at what a fabulous list of summer books you compiled on your blog at http://365greatchildrensbooks.blogspot.com/2012/06/our-summery-summer-reading-list.html !! That is a list that blows my mind how good it is. Imagine taking all those books away on a holiday, I think that any parent would change the lives of his/her kids forever. With just one holiday! Back to Chris Van Dusen - you just put "If I Built A House" ( http://amzn.to/Yg721W ) and "If I Built a Car" ( http://amzn.to/Wxl1nu ) on the top of my review list. I must do a review as soon as possible! Those two books are indeed unimaginably good - we have them both. Yes, I can't believe that these two books are not more widely known. The fantastic rhymes and the incredible illustrations are such a killer combination. If I Built a House is an incredible follow-up on what was already a perfect book (If I Built a Car). Thanks for taking the time to get in touch - and for your reminder about these two fabulous books! Thanks so much for your lovely reply, Read Aloud Dad! I'm so thrilled you enjoyed my blog, as well. It has been such a fun project for me, though I sometimes wonder if I got in a bit over my head by vowing to find 365 fabulous books. Perhaps I should have kept things more general and not set such a lofty goal :) I'm excited about the challenge, though, and while it seems to get harder to find more great books as I go along, I know they are out there just waiting for us! I couldn't agree with you more about how much bigger blogging is than just writing. I've connected with so many wonderful parents and educators along the way, and I'm always so inspired to know how many other people out there are as passionate as I am about reading with their kids. I just love it! I've also found blogging to be a nice creative, educational outlet for me since taking time off from being a middle school teacher. I was always passionate about literacy then, too, so I've enjoyed shifting my focus a bit to more early childhood literacy. Hopefully, I've also managed to introduce people to some great new books in the process, too. It's just a wonderful thing all around. Of course, I'm thrilled to have connected with you and your blog and look forward to all of your future reviews. Thanks again for your thoughtful response, and I do hope that we'll be in touch from time to time! You are most welcome Lauren! The lofty goal is great - it gives your blog such a fabulous identity and mission. I simply love it. I adore the fact that your not reviewing children's books, but Great children's books. There is a world of difference. Thank you so much for the two book recommendations - Miss Rumphius and Ox Cart Man and for including the links to your reviews! They are so moving! I must find a copy of each for our home library - "picture book perfection", I can't miss that! I will share the reviews on my Twitter, Facebook and G+ accounts! Thanks so much for your warm message and kind recommendations! Finally, in response to your invitation to share with you the titles of some favorite books, I'm going to do so. I know kids react differently to books, but, in addition to some that you've already mentioned on your blog, here are twenty picture books that my three kids have loved: The Eleventh Hour; When Dinosaurs Came with Everything; Snowmen at Night; The Escape of Marvin the Ape; Mabel O'Leary Put Peas in Her Eary; Miss Twiggley's Tree; The Seven Silly Eaters; Sir Kevin of Devon; How I Became a Pirate; Pirate's Don't Change Diapers; Eli; Officer Buckle and Gloria; Pssst! ; Unique Monique; Mean Jean the Recess Queen; Never Tease a Weasel (1964 version); Anatole; Miss Suzy; Dino-Hockey; and Turkey Trouble (Silvano & Harper). Thanks for getting back to me with that fantastic list! I have a handful of your selections - The Eleventh Hour (http://amzn.to/ZlnGwG), Snowmen at Night (http://amzn.to/VA2AwB), The Seven Silly Eaters (my review: www.readalouddad.com/2011/01/review-seven-silly-eaters.html), How I Became a Pirate (http://amzn.to/XKADkl)... and my kids adore them to pieces! I've written down your suggestions and The Escape of Marvin the Ape (http://amzn.to/14oRUjZ) is already on my order list, while I have to get acquainted with the others and then they go to my wish list!! And thank you so much for sharing with your followers. I truly appreciate it! My little boy loves to read and his birthday is coming up soon. I want to surprise him with a great book. Where can i find this book? Is it in stores or just online?